KPMG’s Risk Strategy, Governance & Culture team helps clients with sound risk management practices and implementing risk culture. KPMG’s Risk Strategy, Governance & Culture team helps with risk management and culture. Our Risk Strategy, Governance & Culture team helps clients to implement sound risk management practices and embed a risk aware culture to drive good customer outcomes, sound business performance and limit potential misconduct. Effective and efficient governance of an organisation to achieve its strategic intent, whilst also promoting an appropriate risk culture, is top-of-mind for boards, executives and regulators alike. In an environment of challenging growth opportunities, increasingly complex business models and new delivery channels, ensuring that the risk and compliance component of the governance framework achieves its objectives is a challenging task. Is your governance framework structured to enable you to manage risks while executing your organisation’s strategy? Are you clear about your risk appetite? This is a crucial component in effective risk aware operations. 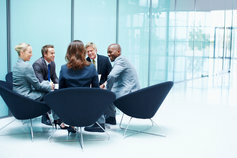 Organisations must understand the degree to which they are operating to their risk appetite as their business develops. Will the governance framework meet regulatory expectations efficiently? Or has regulatory compliance driven a ‘form over substance’ outcome that delivers minimal compliance at maximum cost? About 30 percent of risk activities are wasted activities due to redundancy or duplication. Organisations risk the illusion of quality risk management whilst incurring the expense of poor efficiency. Can you clearly articulate the expected risk culture of the organisation, and assert the degree to which it is consistent with that expectation? This area is challenging boards and executives globally, and must be addressed for an organisation to meet its stakeholder expectations. Risk governance framework development (including design and development of governance committees. and charters, risk reporting structures and methods, and functional governance models). Risk governance review (including annual and comprehensive CPS / SPS 220 reviews). Risk Appetite Statement development and enhancement. Adrian has over 20 years' experience in financial services and industry transformation. Richard is an expert in the delivery of internal audit, risk and control services.